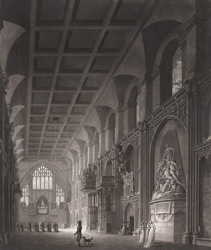 The great hall at Guildhall was the second-largest in England after Westminster Hall. The centre of civic government, it was here that lord mayors and sheriffs were elected and the Court of Common Council was held. The medieval structure was severely damaged in the Great Fire, although the outer walls survived. The flat roof and upper walls were added after the fire, probably under the supervision of Christopher Wren.